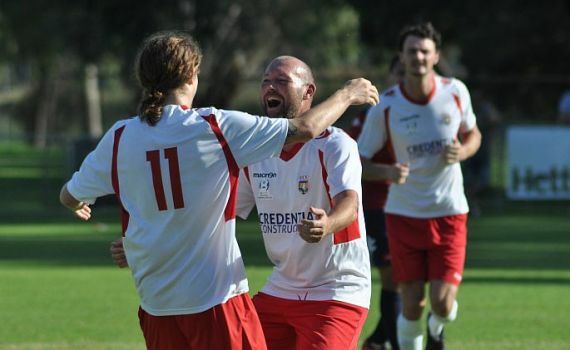 ECU Joondalup have put on a five star performance and in doing so kept in touch with the top five of the PS4 National Premier League WA after a 5-2 win against Balcatta at Grindleford Reserve. Sam Pollard opened the scoring, the youngster scoring his first NPL goal for the club with a stunning strike, before skipper Gordon Smith bagged a brace before the break. Second half goals to Daryl Nicol and Tommy Amphlett put the Jacks in total control, but late strikes from Luccas Mello and Ben Meredith gave the scoreline some respectability for the home side. McCulloch picked the same side that drew 2-2 at Bayswater City last week, with Daryl Nicol and Kevin Moon coming through fitness tests to play. The Jacks dominated early and Nicol’s shot was tipped around the post by Domenico Savoldelli after only two minutes, then Smith picked out Nicol again moments later, but his header flicked off the crossbar. But their early pressure was rewarded on 23 minutes with the lead. Smith and Nicol combined to set up Pollard, and the former Perth Glory youngster fired home from the edge of the box, his first senior goal for the club. It got better for the Jacks two minutes later when they doubled their lead. Nicol burst down the left, his shot was well saved by Savoldelli, but Smith was the quickest to react to the rebound and the Scottish striker fired home from close-range. There was action at both ends, ECU keeper Fraser Greenwood tipped over Mello’s snap shot, before Nicol’s’ curling shot flashed wide of the far post. But the Jacks were dangerous every time they moved forward, and two minutes before half time they added a third. Nicol found space down the right and squared the ball across the box to Smith, who lost his marker and fired home. Nicol was causing the Balcatta defence all sorts of problems after the break, and just before the hour he added the Jacks fourth. A superb ball over the top from Ross Millard found Nicol on the left, he cut inside at pace and raced past four Balcatta before finishing clinically past Savoldelli. Smith had a chances of hat trick moments later, but the Scottish striker was denied by a good save from Savoldelli. But on 65 minutes ECU made it 5-0. Nicol was the supplier this time sending Amphlett in on goal and he finished with aplomb. To the home sides credit they continued to press forward and they were rewarded four minutes later. Mello rounding Greenwood and scoring from a tight angle. Greenwood then produced a fingertip save to deny Meredith, but there was little he could do when Balcatta added their second late. Hanafi Ghazali made space down the left and crossed to Meredith, who headed home from close-range, put it was too little too late for the home side.